Calling up for human agents to fight the alien menace! People attending PLAY - Festival del Gioco (April 5th-7th, Modena, Italy), will have the chance to be the first to play Galaxy Defenders, our upcoming Sci-Fi cooperative miniatures board game, before the start of the Kickstarter campaign (scheduled to begin on April, 16th). Galaxy Defenders: playable preview at PLAY. In this worldwide preview, Galaxy Defenders will be available for playing from Friday to Sunday in Pavillion "A" of PLAY. Many surprises are in store for the brave agents who will accept to tackle the mission! 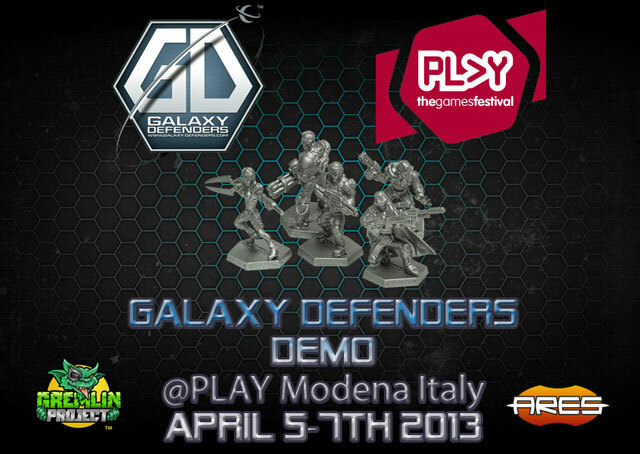 To read more about Galaxy Defenders, visit the website dedicated to the game and its Facebook page.